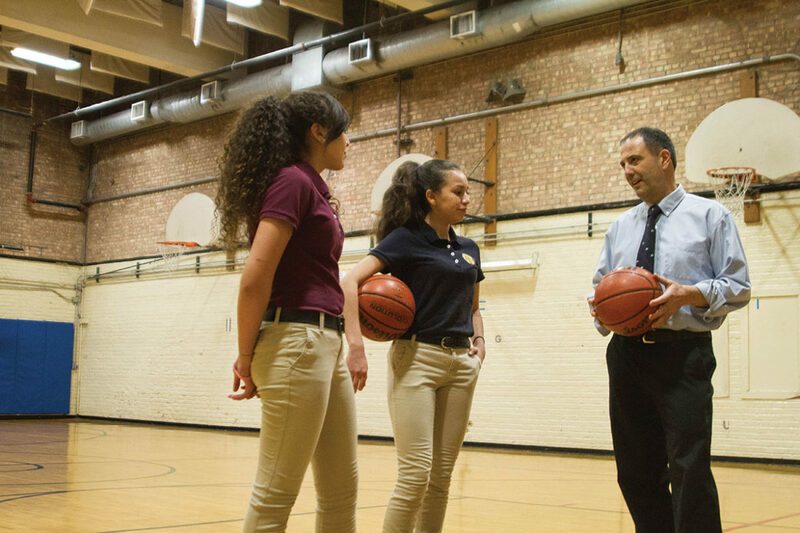 Noble founder and superintendent Michael Milkie makes time to coach girls basketball at the original campus. He is proud of the network’s emphasis on health and fitness. “Every kid here is running miles,” he says. If students don’t meet physical fitness standards, they are required to attend summer school for two weeks. In interviews for this issue of Catalyst in Depth, Michael Milkie, founder and superintendent of the Noble Network of Charter Schools, answered questions and discussed a wide range of issues. The following has been edited and condensed for clarity. What’s the vision and plan for Noble going forward? We believe that we can have the greatest impact overall by staying in Chicago. [He said he’s had requests to expand to other cities and states.] We also want to stay with high schools. We have a plan that says we’d like to get to 15,000 to 20,000 students over the next five years. What do you say to principals and teachers at neighborhood schools who see your expansion as a direct threat to their survival? Certainly Noble is not alone in providing additional choices for families. There are many more charters, selective-enrollment, military and other types of schools today than there were when we opened. In general, I think it’s good that parents have more options and that schools are required to compete both in terms of quality and expressing that quality to market their schools. As Noble has added campuses over the past decade, how challenging has it been to maintain a consistent system of discipline inside of schools? It’s a matter of having really good quality control. And if it doesn’t happen, that’s on me and the central team because we work really hard to inspect it and to make sure that principals are incented to have that done. And, you know, teachers want it. This is what teachers crave: orderly, safe, respectful environments. It’s not hard to get their buy-in. Noble’s past practice of fining $5 per detention is probably what’s caused the most controversy over the years. Why did you finally get rid of the fines in 2014? This year Noble started giving freshmen a grace period to clear all demerits earned in the first quarter. Can you explain why you did that? Freshmen found it hard to adjust sometimes. And we just wanted to give them more time to do that. So, they still serve the detentions, but they don’t count against the cap. Are there other parts of the discipline system that you’re considering changing or relaxing? No, but I want to make sure this is clear: We don’t plan to change anything fundamentally. So, there’s different things that we’ve been less or more strict on as we’ve evolved and some things we see as more important and some as less important, like the fees. But our basic philosophy of holding kids to high expectations with behavior is very much the same, and we don’t think we should change that, no matter how big we get. 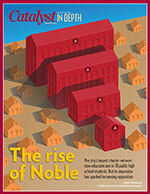 Noble has very few people of color at the top. Considering that 96 percent of your students are black or Latino, how important is diversity to you when it comes to hiring network leaders? Diversity matters. But I really think the most important diversity in our top level is principals. And I think we actually have really strong diversity there. Students all know who the principal is, and that’s the role model that they most need to see. Let’s talk about teachers. About two-thirds of your teaching staff is white. What are you doing to hire more teachers of color? The most significant thing we’ve done that shows lots of promise is the partnership with the Relay Graduate School of Education, which focuses on our alumni, so they’ll look like students. That’s already helped diversify our teaching force. And we just hired a diversity recruiter, who’s also an alum. Teachers, especially females, tell us they don’t feel like Noble is a place where they can have a long-term career. I think staying in a classroom is hard, but I don’t think it’s any different at Noble than anywhere else, other than we aren’t able to pay as much and that makes it more difficult. But if you look at it, we have more women leaders than men at the campuses — from principals to assistant principals and deans. And I think that we’re much more flexible than the district in terms of, ‘Can I have a job that works three days a week?’ Yeah, and we have lots of people that do that. I think that there’s great opportunities to move up, and that’s been evidenced by who we’ve promoted. However, I think it’s always difficult given the hours and the pay issue for male and female teachers. That is something we want to work on. What would it take to increase the pay? The facility funding that we don’t get is probably the No. 1 reason that we can’t pay teachers the same as CPS. We divert approximately $1,000 per student towards facilities, so it comes out of our operating costs. What’s your take on unions? You know the Chicago Alliance of Charter Teachers and Staff has been eyeing your workforce for years. The most important thing we can do is make people happy at their jobs. And if we’re not doing that, they’re going to turn to other ways of making that happen. And they should. So, we’ve got to make sure that, for the sake of a great education for students, that we are not only hiring well, but supporting teachers and other staff well to do their jobs. You’re part of Chicago Public Schools CEO Forrest Claypool’s advisory committee on high schools. What do you think CPS can do to improve all high schools? It’s not surprising that I would think that the district should focus on two of the things that we focus on at Noble: great principals and teachers, and school culture. Those are the two things that make Noble work, and that’s what I would say would best serve high schools. How long do you see yourself at Noble? I hope I’m doing this 20 years from now. I love to see kids be successful. And then there’s the health and fitness thing. I can’t tell you how happy I am when I see kids running miles. I mean, it’s kind of funny, but being in better shape, winning scholarships to college, going from 16 detentions to two detentions in a year — those kinds of things are great, and I love doing them and I love seeing them.